“There’s an app for that” is not only a common phrase, but it’s also often more accurate than we realize. In the context of leading a church, we have apps or software for a variety of purposes including church management software (ChMS), accounting software, volunteer scheduling apps, and more. One tool you may not be as familiar with is fundraising software. Fundraising software (also known as donor software) is a tool for managing and facilitating giving. Contrary to what the name implies, it isn’t used solely for big fundraising campaigns. Donor software typically includes a method for processing online giving, handling event registrations, managing donor information, and more. Fundraising software is usually geared towards general non-profit organizations and is a combination of an electronic giving tool and customer relationship manager (CRM). For most churches, those features may overlap with what they already have in their church management and/or accounting software. Passing the plate and receiving tithes via checks and cash is still standard operating procedure in most churches. However, based on charitable giving statistics, giving methods and trends are moving toward more online donations (although we don’t foresee the full extinction of passing the plate anytime soon). With fewer people carrying cash or checks with them on a regular basis, your church needs to provide a way for your congregation to give with the device they carry with them everywhere - their phone. When you leverage fundraising software, you can provide people with the option to donate via a text message, a church giving app, or online giving. 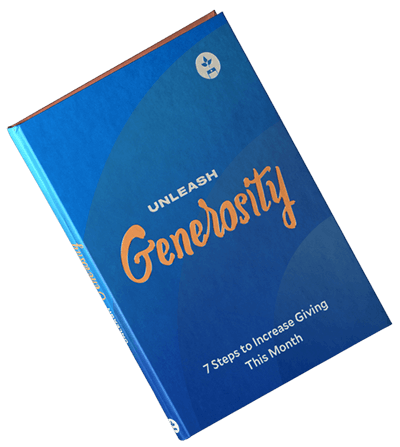 By offering a giving method that’s convenient, you’re taking down a potential barrier to giving. Do you dread the summer giving slump you experience as families go on vacation? That’s based on the idea that people have to be sitting in a church service to give. You can change that dynamic by encouraging people to automate their giving. Most donor software includes the ability for givers to set up automatic recurring donations. We’ve found that churches that offer a mobile giving option experience steady giving (and sometimes an increase) during the summer months. A businesswoman who is traveling for work who watches the service online and gives at that time. The couple who knows they’ll be more faithful to tithe if they schedule a recurring gift each month. The 20-something church member who doesn’t carry a checkbook (and hasn’t written a check in months). Receiving more tithes and offerings is terrific. However, you also need quick and accurate information so you can steward those resources well. The best fundraising software includes reports that show how much your church received in tithes and offerings – by time period, designated or general fund, and other variables. This enables you to review trends and get a quick snapshot of your church’s income. When someone gives online, that’s one less check your bookkeeper has to process and deposit at the bank. It’s also less cash your team has to keep secure over the weekend. Many fundraising software vendors provide functionality that makes it easy to record transactions in your accounting and/or church management software, run reports, and reconcile deposits with your bank statement. With Tithe.ly, you can even enter check and cash gift information so you can track online and offline giving in a single system. This makes it easier to provide donors with comprehensive giving statements on-demand. If all that sounds great – don’t rush away to select your donor software yet. No matter how cutting edge the tool or how many features it includes, it’s only as useful as your team is prepared to implement and roll it out to your congregation (although we wish we could automate that part for you too). We’ll admit to being a bit biased, but we think our fundraising software is the best. However, we encourage you to carefully research any vendor you’re considering to ensure it best fits the needs of your church. Be sure to include your church administrator or bookkeeper in the evaluation process. This decision will have a significant impact on their responsibilities, so you want them to be involved. Is the vendor focused on serving the church or non-profits in general? Does the company have experience with and understand what churches need? What are the fees? You’ll need to know about fees per transaction, monthly fees, setup fees, etc. Ask for details. Will the vendor help you get started? Do you need to get a merchant account or will the vendor help with that step? Does the vendor provide training for your staff? Do they offer online videos and documented instructions on how to enter transactions, reconcile deposits, transfer data to your ChMS or accounting software, etc.? What ongoing support does the vendor provide? When does the vendor deposit donations into your church bank account? Will they process those deposits the next business day, once a week, or once per month? Does the vendor adhere to industry standard online security protocols? Ask about PCI compliance and how they protect credit card data. How many clicks does it take to donate? If someone has to go through ten screens and a lengthy account setup process to make a one-time gift, they’re not likely to use it. Once you’ve decided which fundraising software to use, your church administrator will need to work with the vendor to set up the software. He or she will also want to develop processes for recording the transactions that come through the fundraising software and how you receive reports regarding giving. One way Tithe.ly makes this process easier is by integrating with popular ChMS tools such as Elvanto, Church Community Builder, Breeze, Shelby, FaithTeams, and ROCK RMS (with more on the way). You don’t want your church administrator spending time entering donation data when a simple integration could do the work in a fraction of the time. Anytime you launch something new, you’re likely to have a few bumps along the way. It’s best to have a small group of people experience and help you smooth out those bumps instead of the entire congregation. Before the big rollout, ask church staff members, elders, and a few key volunteer leaders to try out the giving options. Make sure you have a few people in this pilot group who aren’t exactly known for being tech-savvy (their questions and feedback will be very helpful as you develop instructions for the main launch). Take notes on what questions you receive from the group and any input they provide. Use this information to develop your communications materials to the full congregation (information on the church website, slides, stage announcement script, videos, bulletin). This leads to our next recommendation. You’re introducing something brand new to your congregation. You want this to be successful from the start, so that requires a bit of planning. Decide how you’ll present these new giving options and what communication methods you’ll use. To make this process easier, Tithe.ly provides a full launch kit with slides, graphics, and videos you can use to introduce it to your congregation. You’ll need to continually mention the new giving options beyond just the first Sunday. People will forget, or they may not have been in service that week. Remind your congregation at each service that they can give online, via the app, via text, or at a kiosk. Post information about online giving on the church website and social media accounts. Also, place instructions in the bulletin and on-screen during the giving time of your worship service. Periodically (especially around year-end), announce that donors can view their giving record online and provide instructions on how to do that (your accounting team will love you for this one!). The ability for donors to set up recurring donations, view their giving records online, and even print an annual giving statement reduces the volume of requests for those transactions – saving your church administrator countless hours (especially during year-end and tax season). When you save your church administrator time, you free him or her up to handle other projects to support the growth and health of your church. Donor software is a valuable tool that can lead to more consistent giving, increased giving overall, better giving reports, and less time spent on bookkeeping. As more people seek to donate online, it makes sense to provide them with that opportunity.